It's finally starting to feel like summer and for me hot weather goes hand in hand with cold food. 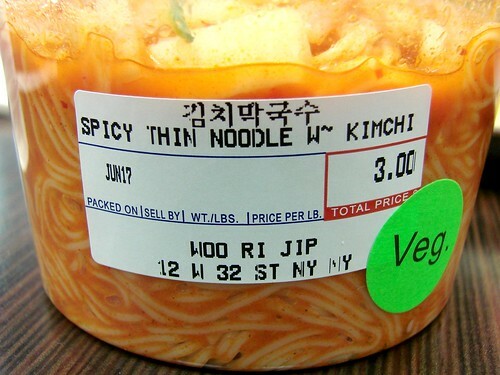 And as Zach Brooks at Midtown Lunch says: "65% Humidity Means It’s Cold Noodle Time..."
A couple weeks back I discovered that Woorijip has a Spicy Thin Noodles with Kimchi for $3.00. In all my years going to Woorijip I've never noticed this dish. The noodles were cool, pleasing and not terribly spicy--I actually wouldn't have minded if they kicked the spice factor up. Nevertheless I'm a sucker for trying new things and I always appreciate discovering an under $5 lunch. Woorijip's daily selection can vary, but look for this in their refrigerator case. That looks delicious.I love spicy kimchi.Your blog looks great (and my son loves your sesame street videos) I'd love to guide our readers to your site if you won't mind.Just add your choice of foodista widget to this post and it's all set to go, Thanks!